NUM Presentation Dinner. See note below. Press cutting courtesy of David Nicholls. Back row right hand side with glasses!George Spence. 3rd row back left hand side,Ennis Garfield. Man at the back in the left hand corner is my Grandad, Tom Marrison. Ironically my mother, his daughter, was showing me the certificate only today, that he received at the dinner. I’ll see if I can get a picture and post it up. I think this was 1979, but will check. 2nd row 3rd from left is Bill Harris. Press cutting courtesy of David Nicholls. A presentation dinner arranged by the Westthorpe Branch of the N.U.M. was held at Eckington Civic Centre on Saturday. Guests included Mr Ray Ellis, M.P. and Mr Conrad Hess, Manager, Westthorpe Colliery. 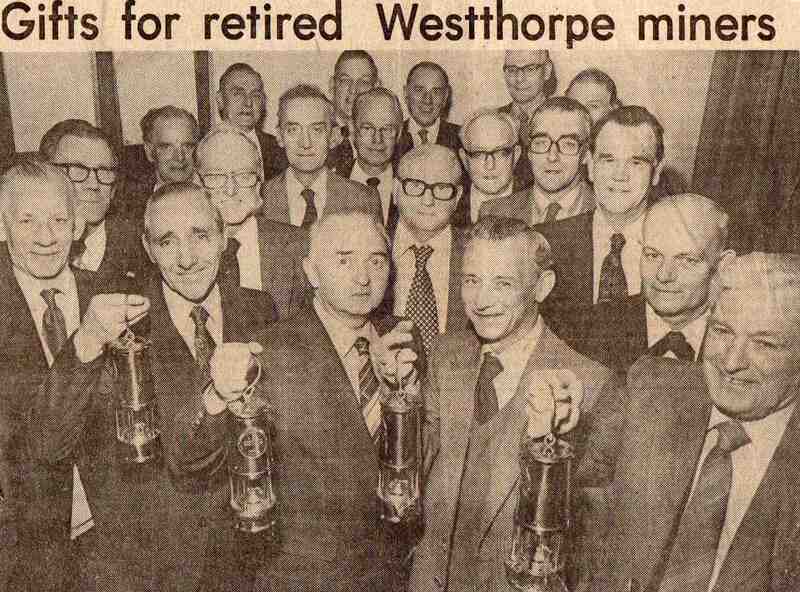 Mr Ellis presented 30 retired miners with brass miner’s lamps on behalf of the branch N.U.M. Mr Hess presented each miner with long service certificates and a cheque for £125 to each man with 20 years service plus a free holiday in Skegness for themselves and their wives, on behalf of the Area N.U.M. A monetary gift for drinks during the evening was also received. There was dancing and a cabaret. Front row: ??, ? ?, Mr Gascoigne, Percy Nicholls, Mr Hallowes, Cyril Deakin. Second row: ? ?, Fred Safe, Len Smallshaw. CAN YOU GIVE ANY OTHERS AND FILL IN THE GAPS?